HARRY’S BAR (VENICE, ITALY): During my last trip to Venice, I became a “regular” at Harry’s Bar, albeit sadly only temporarily. By the second visit, the waiter inquired if I would again like a bellini, (Prosecco with rosy-hued peach puree.) Thereafter, when I entered, he would give a nod and subtle smile. Whenever I am in Venice, I relish spending time at this iconic bar where I find the ambience enchanting and service impeccable. I think the patrons who complain about the prices, dress code, and service just don’t get it. This is an elegant, historical place which has maintained the tradition that has made it so loved. If one looks close, it will become apparent that Harry’s has a surprisingly simple approach to drinks, cuisine and atmosphere. 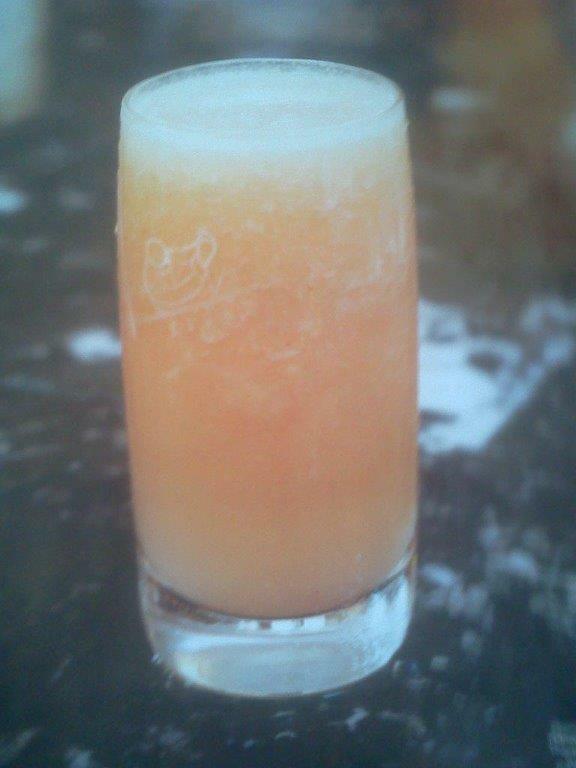 Bellinis are served in the simple clear highball-type glass etched with the Harry’s Bar logo. They favor local, relatively inexpensive wines over high-priced wines. The food is simply but perfectly prepared, such as the popular French toasted cheese sandwich. The upstairs dining room also serves fresh, simple, sumptuous food. I like to slide into the bar in the afternoon to relax and refresh myself in between exploring areas where tourists are seldom seen. My smile, polite salutations and attempts at speaking Italian have always been greeted with nothing but cordial attention and professional service. For me, Harry’s is worth every penny I’ve spent there. 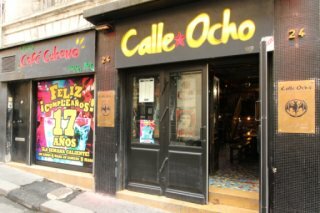 CALLE OCHO (BORDEAUX, FRANCE): Cuban music was blaring out onto the pedestrian-only street in Bordeaux. Ever a lover of music venues, and a huge fan of Cuban music, I ventured in. This was an atmospheric, dive bar with mojitos being mixed and served non-stop. Cuban cigars were plentiful in the din of the music and many languages being spoken. I made the mistake of saying a few friendly sentences to the enebriated woman beside me. That did it-she unleashed a torrent of words along with large plumes of smoke, telling me of moving from Cuba to Bordeaux and then a series of unfortunate events that had befallen her with regard to love, work and where she lived. Shaking my head in a sympathetic manner apparently encouraged her, but in reality I only understood a portion of what she said. This loud, lively convivial Cuban bar was a surprising find in Bordeaux, although my new “friend” discreetly informed me of the abundance of ex-pat Cubans living there. RIO SCENARIUM (RIO DE JANEIRO, BRAZIL): The exhilarating, pulsating rhythm of Brazilian samba greeted us as we exited our cab to the colorful three story beacon that is the Rio Scenarium located on an otherwise dark street. We were seated on the first floor where we primed ourselves with caipirinhas – Brazil’s national drink – and danced to the infectious music. Samba was excellently executed, but all styles of dance were welcome. The crowd consisted of all ages; the younger crowd gravitated to the upper two floors for music more suited to their taste. We had friendly table neighbors, and talked when we could make ourselves heard. Rio Scenarium’s evocative atmosphere is an eclectic explosion of antiques, memorabilia, and kitsch. PALAPA BAR & GRILL (AMBERGRIS CAYE, SAN PEDRO, BELIZE): Sitting under the square palapa (palm grass) roof overlooking the crystal clear, vibrant blue of the Caribbean below is one of my favorite bar views. 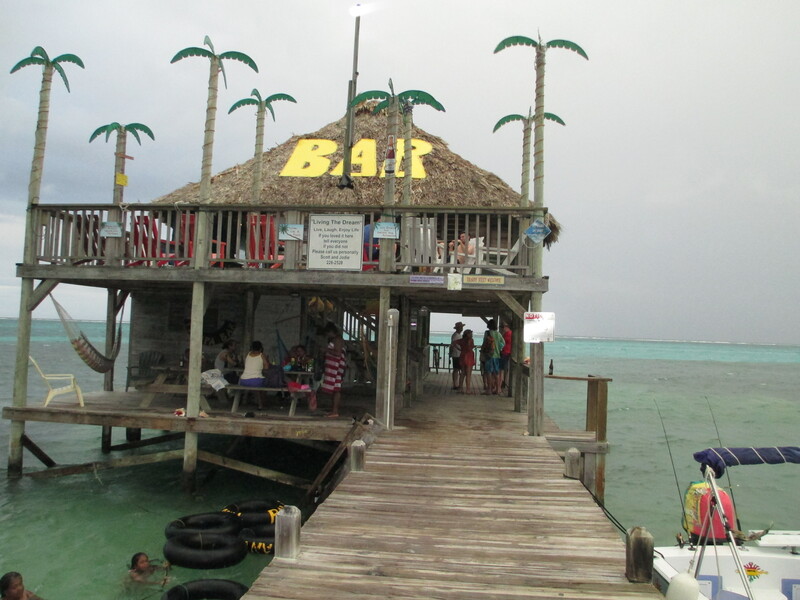 A half mile north of San Pedro town, is Palapa Bar & Grill. We stumbled on it, or more accurately, discovered it when our family was exploring the north end of Ambergris Caye while driving a golf cart (the standard mode of transportation on the island.) The main bar is on the second floor which affords a panoramic vista of the water out to the barrier reef, the second longest in the world. We love the fresh fruit cocktails and “mocktails” for the kids. The other “bar” is in the water below where you can float on inflated tire inner tubes while buckets of icy cold local Belikin beer are dispatched to you by rope. Don’t forget to “leave your mark” by writing something on the bar. TOP OF THE MARK (INTERCONTINENTAL HOTEL: SAN FRANCISCO): Swing dancing on the 19th floor rooftop bar with a spectacular 360 degree panoramic view of the San Francisco skyline is a rarified experience. Located on Nob Hill in the Intercontinental Hotel, the historic bar opened in 1939. What made this locale particularly fun was the live entertainment. On several occasions, I had the chance to listen and dance to the Stompy Jones band, who play revved up “jump style” swing music. The sextet was formed in 1998, and has since received numerous accolades and awards, even being featured in two movies. Donning characteristic short 1930’s-style ties, the band features bounce, piano, thumpin’ stand-up bass, double-shuffle drumming, trumpet sax, and vocals. I also enjoyed the talented pianist and vocalist, Ricardo Scales, who plays many musical styles; my favorite is Latin Jazz. Sample the ambitious “100 martinis” offered at Top of the Mark. The last time I was there the service was extremely poor, even though the bar was not that crowded. MOCAMBO BAR (TAORMINA, SICILY, ITALY): After an Italian woman spontaneously stood up and danced an exactingly authentic tarantella to the live transient band at a panoramic restaurant in Taormina, we were eager for more music and dance. We headed down the street and in the main square found Mocambo Bar. Unaware of its storied past, opening in 1952 and hosting a number of celebrities, we settled in on the outdoor patio adorned with oleander and orange blossoms which had views of Mt. Etna and the sea. Not usually one for audience participation, when summoned, we reluctantly joined other enlisted audience members to play various percussion instruments with the keyboardist in the indoor part of the bar. Our shared experience and musical ineptitude cemented an immediate bond between we newly recruited musicians; we sat together sharing travel stories, laughing, drinking and dancing. It was a magical night. HEARST CASTLE NEPTUNE POOL PATIO (SAN SIMEON, CALIFORNIA): We sipped our sparkling wine by the Neptune Pool, against the backdrop of the Pacific Ocean on one side and the imposing Casa Grande (more commonly called Hearst Castle) on the other. 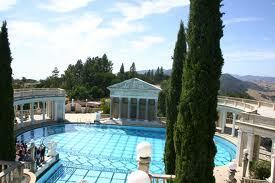 Construction of the Neptune Pool with its Roman temple façade began in 1924, and after several design changes was finally completed in 1936 with marble pavilions, serpentine tiles, fountains, and alabaster lanterns. We dressed in period clothing, as did many other attendees at “Enchanted Evening,” the Castle’s annual gala. We walked around the pool while sampling appetizers and listening to the chamber string orchestra in this mesmerizing location. As the fog rolled in, the lighting proffered an ethereal atmosphere. We reluctantly tore ourselves away and headed for the dinner and auction with hopes of winning the opportunity to swim in the Neptune Pool. 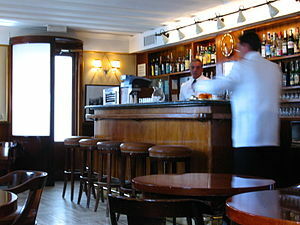 HEMINGWAY BAR (RITZ, PARIS, FRANCE): Tucked in the back of the Ritz is the legendary Hemingway Bar. Renowned bars are often over-rated – the Hemingway is a noteworthy exception. The atmosphere is cozy and clubby with wood walls and comfortable leather chairs, tasty snacks and fantastic cocktails. Papa’s gun, bust, and mementos adorn the walls. Mixologist extraordinaire Colin Field made this the place to get the city’s best cocktails. The Ritz and the Hemingway Bar closed for major renovations not long after we stayed there in 2012, but plans are for the Bar to re-open after the improvements. I just hope they will retain the original atmosphere and convince Colin Field to return. 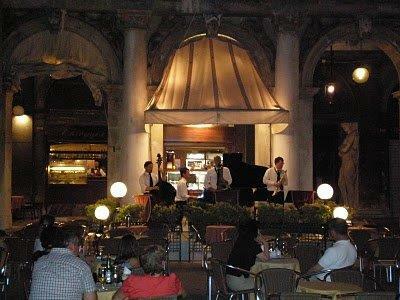 GRAN CAFFE CHIOGGIA (VENICE, ITALY): Located on Piazzetta di San Marco with views of St. Mark’s Basilica, the Doge’s palace, the clock tower and the lagoon, Gran Caffe Chioggia is always my final stop for the evening. The band is phenomenal, the best on the Piazza or Piazetta, and I daresay some of the most talented, entertaining musicians. Led by the exceptional violinist, Joseph Martin Miotti, the band plays a dazzling array of musical styles including classical, gypsy, swing, rock, tango, movie themes and more with the other band members playing piano, stand-up bass, accordion. The charismatic Joseph manages to communicate humor in some songs such as his quirky rendition of the theme from the Pink Panther movie (which can be seen on YouTube.). We found the tuxedo-clad waiters professional and polite; service can be slow and it is expensive, but there is not a cover charge to listen to the music as there are in other venues on the Piazza. Many people choose to stand outside of the seating area to enjoy the music, but I prefer a more experiential encounter by sitting in the thick of the action. In inclement weather, the band plays under the historic portico. 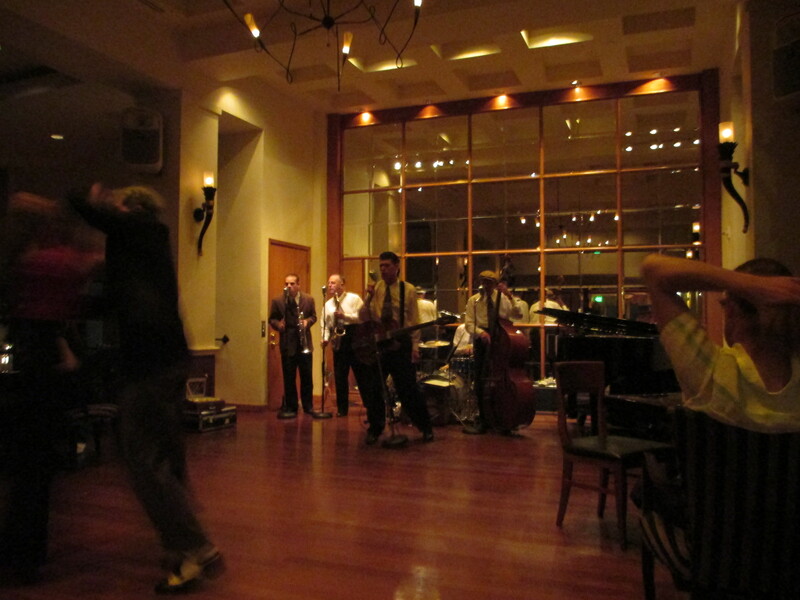 During my first visit many years ago, on a rainy evening we enjoyed swing dancing to the band’s big band sounds under the warm, amber-hued lighting under the portico. series of pianists until closing at 12:45 a.m. The Petrosssian Bar has varied offerings including traditional afternoon tea service, Russian specialties such as caviar, smoked salmon, and vodka samples, and a nice selection of wine and specialty-infused cocktails. Only a few short steps away is the Lounge at the Baccarat Bar, which features classic jazz in a stylish, sleek environment. 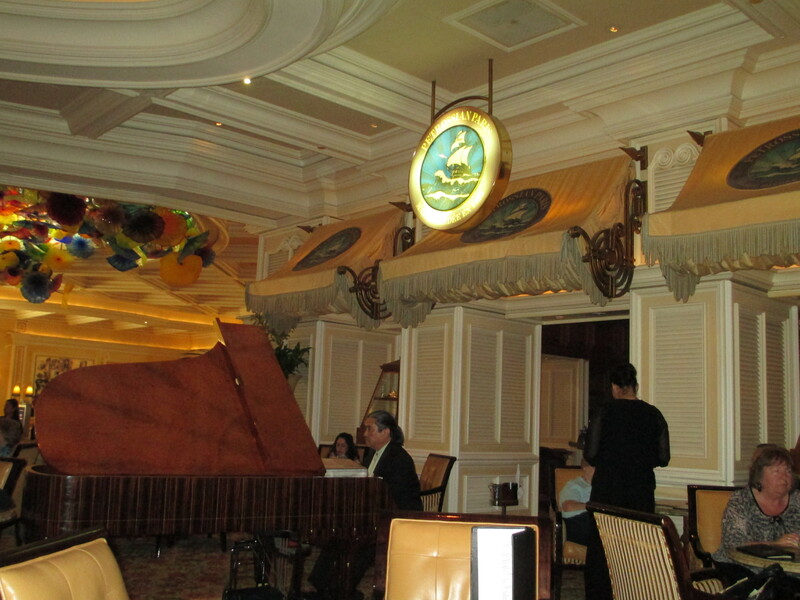 The rotating musicians typically include a pianist/vocalist and a stand-up bass. The Lounge affords of a view of the high-end Baccarat gaming. I was quite amused by the cast of characters playing Baccarat – those dressed to the nines, slouchy-dressed, nervous chain smokers, young hipsters, superstitious seat movers, and more. The bar offers a good selection of wine and cocktails. Performances start at 4:15 p.m. and continue until 1:00 a.m.
Hope to see you soon: Cheers! Recent reviews by Dawn S.